I feel better this morning about what I thought wasn’t much of anything yesterday. Yay, for me, I DID do some extra foot work. I’m going to get through this. LOL at this point I’m thinking it’s going to kill me, but damn I’ll look good. BONUS – Yesterday I received a package in the mail. That in itself is not unusual. 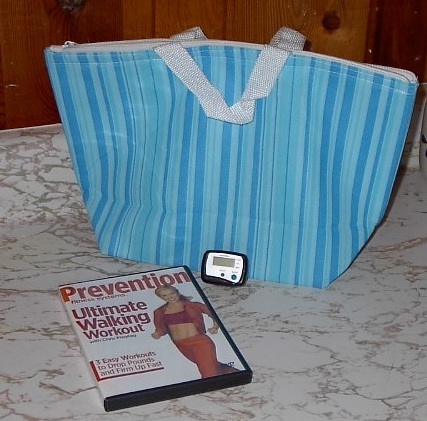 What was so great about it was that it had my “Thank You” gifts from subscribing to Prevention magazine! Something I had totally forgotten about. It included a bunch of junk mail, so I pitched that, but it also had a Prevention Fitness Systems, Ultimate Walking Workout with Chris Freytag. I haven’t opened it yet, but I figure this will be excellent for the days I’m not able to walk, or to add walking without leaving the house. There was the cutest insulated lunch bag. Finally, there was a pedometer!!! You see, just before I left the office for lunch, I was being all cranky about taking the trouble to find my (3) pedometers, and then discovering that none of them worked. Of course, the new one is a cheap give-away, but it’s something I wouldn’t necessarily go out and spend money on. FREE is always good. The Diva can tell you what a Big Fat Whiner I can be, but I’m not whining today! I dropped 2 POUNDS this week. Yay, for me!!! Since the weather wasn’t very good for walking today, I opened my free DVD. It’s great! I did the entire DVD, just to see how it was going to be. I found it easy to follow, and even though I don’t usually break a sweat, today I did. I believe all segments totalled 2.5 miles of walking. I’ll definately pull it out again.